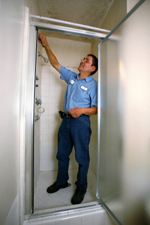 We are the Shower Specialists. The company was mainly involved in bathroom remodelling, everything from carpentry to plumbing to floor & wall tiling. Gradually building the reputation as a specialized trade, the company focused its resources & abilities solely on bathroom enclosures. What hasn’t changed though is the company’s reputation for excellence grounded in more than 25 years’ experience in the bathroom industry. In 2008 & due to the growing clientele, the founder Stelios Konikkos was compelled to go into partnership with a Specialist in the field and to adopt the new business name, Konikkos & Dionysiou Shower Specialists Ltd. The new ownership, two motivated Cypriot family members, continued with the same family principles offering a flair for the aesthetics of shower doors combined with the practical skills to be successful. Assuring that the company was in safe hands, the founder of the company retired in 2009 & the company is now moving forward with the same principles, long history & rich tradition of satisfying the customer in everything we do. The company now boasts the Largest Showroom & the Biggest Selection of Shower Enclosures in Cyprus with now having the ability to provide a wider range of products to more people & create any shower enclosure for any space, regardless of any architectural limitations. “A Shower Enclosure is about giving your bathroom a new lease of life; we go to great lengths to make sure You, the Customer, are comfortable with the design & quality of the product, the cost & the service we provide”.